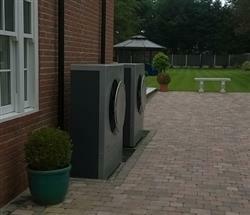 Reina Group installed two 18kW Danfoss air source heat pumps (ASHP’s) into a large property in Manor Road, Chigwell back in 2013. A full Heat loss (to MIS3005) and MCS 020 ASHP sound level calculations were performed to determine sizing & location. The dwellings total energy requirement was a little over 60,000 kWh/year to include heating & hot water and a 3 phase electrical supply was available. Two number Danfoss DHP-AQ 18kW units were installed externally (see pictures, the units look as good as new) with a 400 litre buffer vessel & 500 litre direct hot water cylinder installed within a utility room. The controls also included a Danfoss On-line AQ support which means that Reina Group can monitor remotely.